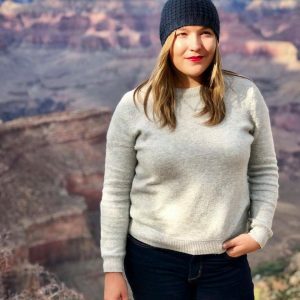 Alexia Bednarz graduated from Arizona State University in 2013 with a bachelor’s degree from the School of Sustainability and a minor in design studies from the Herberger Institute for Design and the Arts. Shortly after graduating, she landed a job with U-Haul, where she still works today as a community advocate for corporate sustainability. 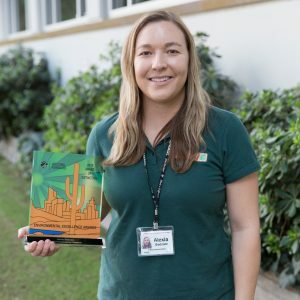 Bednarz was recognized on October 6 as a “Sustainability Champion” by Arizona Forward during a ceremony in which she received an Award of Distinction. Bednarz answered a few questions for us about how she ended up as a sustainability major and how the degree has propelled her career. Answer: I originally was accepted into the W.P. Carey School of Business and about a month before school started, the university called to tell me about a few new business certificates that were available. One of the new certificates was in sustainability and my mother pleaded with me to pursue that option. I gave into her pleading and while pursuing the certificate, I took my first intro to sustainability class. I switched to a sustainability major almost immediately after that introductory class, because I felt that I could use a sustainability degree to make a difference in the world. Q: Why did you choose ASU/the School of Sustainability? A: I have a beloved sister that went to ASU and because of her I grew up with intrinsic sun devil pride. ASU was an easy choice, because it was located in such a beautiful state, was investing in innovative fields and had a wealth of student resources. The School of Sustainability was touted as the first in the nation and I knew that if anyone had an edge in this field of study then it would be ASU. Q: How has your sustainability degree helped you succeed at U-Haul, or in your career in general? A: My studies at ASU have given me a very well rounded understanding of sustainability as it applies to many different areas and fields. "Sustainability" was a term that needed to be explained during most job interviews at the time and I felt prepared to explain sustainability as it applied to each position. In my career, I am regarded as a master in my field and I am asked to facilitate collaboration between departments to integrate sustainability systems and thinking into everything we do. Q: Can you tell us more about the various sustainability projects you’ve worked on? A: Working for U-Haul International, I have enjoyed working on hundreds of international energy efficiency projects, founding the Midtown Farmers Market at the U-Haul Midtown Campus, cataloging adaptive reuse buildings and creating sustainability programs and tools from the ground up. In my personal life, I have enjoyed implementing waste diversion strategies for neighborhood community events and nurturing my backyard food forest. Q: How did you feel when you heard you were nominated for the Sustainability Champion Award? A: I was absolutely honored at the nomination. I immediately thought of all of the people in our community that I would consider sustainability champions. I had never taken the time to consider that I might be one. I am so grateful to work in a community that acknowledges sustainability changemakers and initiatives. Regardless of the award, I would still be doing the work that I am doing as it gives my life purpose, but I am appreciative for the acknowledgment and it fuels me to keep working and innovating. A: I feel as though I view the world as a designer, where I look at existing objects and systems and ask myself how I might make meaningful improvements, so for me, sustainability is the solution that has been there all along. Where efficiency meets productivity, thoughtfulness and beauty.